The third re-release of volume 1 was on December 7, 2005, and the re-release has reached volume 12, which was released on June 24, 2009. Volume 21 was published by Dark Horse on July 6, 2005, and volume 33 was released on August 29, 2009. On August 6, 2014, Dark Horse published the 46th volume of the manga series. On March 19, 2014, it was announced that the series would conclude with the 48th volume, which was released in North America on October 20, 2015. The final volume of the manga was also released in Japan as a limited edition box set containing a special edition of volume 48, a mini book of all the Adventures of Mini-Goddess comics that appeared in the first volumes of the manga, a drama CD featuring the anime voice actors, and a selection of high quality prints of past volume covers, and the final volume cover. The OVA was licensed for release in North America by AnimEigo, who released all five episodes in individual VHS volumes in both English-language and subtitled Japanese-language editions between June 29, 1994 and August 31, 1994. They later released all five episodes across two DVD volumes in 2001, then re-released the episodes in a single "Remastered Collector's Edition" set in 2006. AnimEigo's license expired at the end of February 2010. In March 2010, TBS announced they were producing a brand new 7-minute OVA for release only with a repackaged and redesigned boxed set for Season 1. Currently, no plans exist for licensing that special OVA episode. The OVA was the first new anime production since "Fighting Wings" was produced for the 20th anniversary of the manga series. Kodansha released the first OVA for the anime series, bundled with volume 42 of the manga series on February 23, 2011. 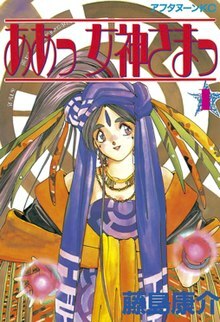 Volume 42 of the tankouban series was released in two versions, in a standard version without the OVA and a limited edition release contains the OVA. Kodansha produced a second OVA for the anime series. Volume 43 of the tankouban series includes this OVA for the anime series, and it was bundled with the manga release on September 23, 2011. In February 2007 an Ah! 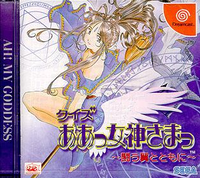 My Goddess game developed by Marvelous Interactive was released in Japan for the PlayStation 2. The game was only released in Japan and was released in 2 editions, the limited edition (also known as the "Holy Box" edition) and the regular DVD edition. Currently there have not been any plans for the game to be licensed and translated into English. This page was last edited on 21 March 2019, at 16:07 (UTC).